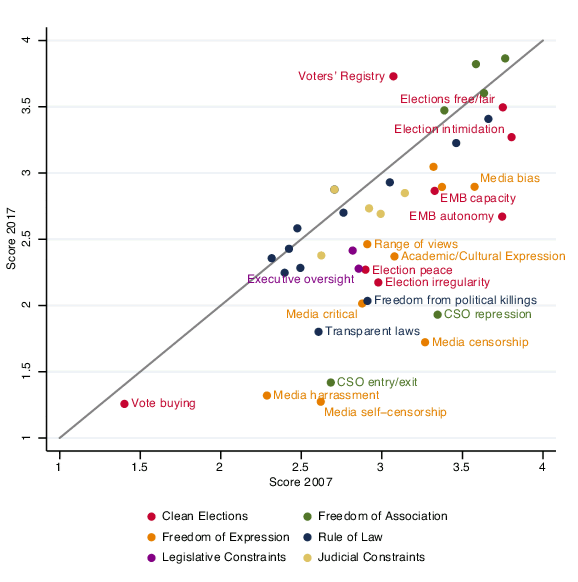 Even as India goes to polls, a recent European Union-assisted Varieties of Democracy (V-Dem) report, claiming to provide "new ways to study the nature, causes, and consequences of democracy embracing its multiple meanings", has raised the alarm that "freedom of expression, media, and civil society are under threat", especially in "key countries, such as Brazil, India, Poland, Russia, Turkey, and the United States." Noting that "autocratization is now manifesting in a number of large countries, including Brazil, India, Russia, Turkey, and the United States", the report ranks 178 countries across the globe for its liberal democracy index (LDI) to say that "the recent significant declines in liberal democracy in India and the United States alone have affected some 1.6 billion people, while less than 1 million people benefited from the improvements in Bhutan and Vanuatu." The 2018 report ranks India's DLI at 81, down from 78 a year earlier. Among the neighbours, while Pakistan and Bangladesh rank worse than India, 109 and 135 respectively, three other neighbours rank better -- Bhutan 62, Nepal 70 and Sri Lanka 75. If small European countries are best performers (Norway, Sweden, Estonia, Switzerland and Denmark), among other major countries, Australia ranks 8, Germany 14, UK 16, Canada 20, Japan 25, USA 31, Israel 53, Brazil 56, China 167, and worst is North Korea,178. Asserting that "during the last two years, there is a striking rise in the share of the world’s population living in countries backsliding on democracy", the report says that the countries that are part of a global autocratization trend include India, the United States, Brazil, Russia, Democratic Republic of Congo, Turkey, Thailand, Ukraine and Poland." Pointing out that the world’s most populous democracies – the United States and India – have joined other democracies that "registered as backsliders" during the preceding year, such as Brazil, Hungary, Poland, and Suriname, the report insists, "The pattern of backsliding in the most populous democracy – India – exemplifies this trend." According to the report, "In India, the infringements on media freedom and the civil society activities of democracy following the election of a Hindu-nationalist government have started to undermine the longest-standing and most populous democracy in the Global South", even though "the main indicators of the core electoral aspects of democracy do not show significant decline." The report wonders, "It remains to be seen if this trend will be reversed in the coming years or if India will descend further into the authoritarian regime spectrum – as during their authoritarian interlude from 1975-77." According to the report, "The most populous democracy in the world, India, is at risk. Its level of democracy has declined significantly over the last decade. The disquieting trend particularly concerns freedom of speech and alternative sources of information, civil society, the rule of law, and some electoral aspects." Underlining that "much of these changes have taken place after the Bharatiya Janata Party won the parliamentary elections in 2014 and its leader, the current prime minister, Narendra Modi, assumed office", the report describes him as "a hard-line Hindu nationalist". 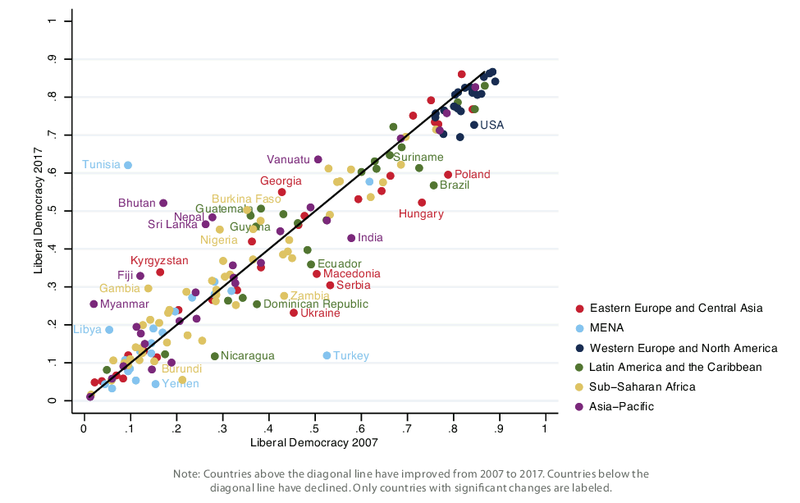 Providing a 10-year comparison, the report says, multiple indicators in the V-Dem liberal democracy index show that "only one indicator – for the quality of the voters’ registry – has improved... All others have either stayed the same or declined over the last ten years, and the latter include no fewer than 19 indicators." The report believes, "While there are about 12,000 newspapers circulating in India today, the media is increasingly being censored. Several newly introduced or more harshly enforced laws hinder free speech and encourage censorship. For example, India’s law on defamation contains prison sentences of up to two years and is used to silence critical journalists at an increasing rate." "Moreover", it says, "Sedition laws that were upheld by the courts in 2016 even allow harsh punishment of people accused of inciting 'dissatisfaction' – disloyalty and all feelings on enmity – towards the government. Its existence serves as a deterrent and encourages self-censorship." It continues, "Harassment of journalists is also on the rise. Many journalists have been murdered or threatened for reporting critically on the actions of the ruling party. Three journalists were killed in march 2018 alone." 'For example", the report says, "Editor Gauri Lankesh, who was a known feminist and critic of the caste system as well as of the Hindu nationalists, was shot dead in September 2017. A hardline Hindu nationalist was arrested in connection to her murder but no sentence has been handed down." 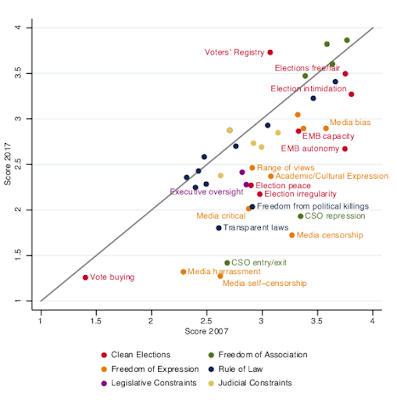 It adds, "The sharp decline in the V-Dem indicators on freedom of expression − in particular self-censorship and media harassment − refect the increasingly adverse environment for members of the media." Coming to civil society, the report says, "The autocratization-process in India has also led to a partial closing of the space for civil society. The government increasingly restricts the entry and exit of civil society organizations by using a law on foreign funding for NGOs, the Foreign Contributions Regulation Act (FCRA). As of 2017, 20,000 CSOs – mainly working on human rights and environmental issues – have lost their licenses. After that only 13,000 CSOs remain to continue working unconstrained." The report also notes, "Three UN special rapporteurs have urged prime minister Modi to repeal the FCRA, claiming it is progressively used more to 'silence organisations involved in advocating civil, political, economic, social, environmental or cultural priorities, which may differ from those backed by the government'. Observing a "noticeably large drop in the V-Dem indicators on the ease of entry and exit, and the level of repression of civil society organizations in India", the report says, this suggests that "law enforcement is gradually becoming less predictable, and that the state fails to effectively protect its citizens from politically motivated killings." Even though pointing out that "elections in Asia’s oldest democracy have remained free and fair and open to multi-party competition", the report says, "Nevertheless, several indictors capturing how clean elections are, have declined. In particular, intimidation and violence have increased at polling stations." Thus, "Party agents intimidate, harass and bribe voters, in effect preventing them from casting their votes freely. electoral violence includes deadly attacks against polling officials and voters on their way to polling stations."